Winter weather has hit the Kanawha Valley with a vengeance, which means it surely must be time again for United Food Operation (UFO) to get down to business. Accordingly, the Charleston-based all-volunteer organization will kick off its 32nd annual food distribution program on January 24 and run it through April 12 this year. Elaine Harris, who has served as the program chair since its inception in 1981, said UFO will work out of the same distribution center at the Bayer Crop Science facility in Institute that it has been using for several years. Harris, in a Charleston Daily Mail interview, said times are especially tough this year. Numerous area employers support the program but more are needed, Harris said. She explained that, unlike many other food banks, UFO does not charge the pantries for the food it provides them. Pantry leaders say they are hard pressed in the cold weather season to keep up with the increased demand for their services. Demand is higher in winter months for a number of reasons but the primary one is higher utility bills for heating leave less in the famlly budget for food. At the Institute distribution center, UFO volunteers will collect, receive, and sort food on Fridays and distribute it to pantries on Saturday mornings during the 10-week period. Thirteen food pantries in Putnam and Kanawha counties participate in the UFO program. Christian Community Cupboard in Hurricane; EnAct, Inc. in Chesapeake, Montgomery, and Clendenin; Covenant House of Charleston; Heart and Hand Community Service Center in South Charleston; Nitro Community Services; Pocatalico/Sissonville Community Food Pantry; St. Albans Community Food Pantry; Mountain Mission in Charleston; Salvation Army in Charleston; and Five Loaves/Two Fishes in Poca. A teleconference call with UFO officers and volunteer leaders will be held Wednesday, January 15, 2014 8:00 AM to discuss plans for the UFO kick off and subsequent pantry distributions for this year. For more information about how you might help or get involved as a volunteer, call Elaine Harris at 304-342-2023. The E.I. Dupont plant at Belle and the Dow facility at Institute Industrial Park have both committed support to United Food Operation’s (UFO) 2013 winter food distribution program. E.I. Dupont’s Pamela Valentine (2nd from right) presents a contribution to UFO chair Elaine Harris (center) to help the 2013 program. 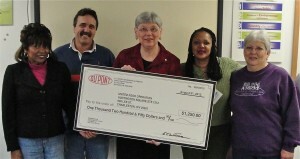 Dupont employee Pamela Valentine, who also serves as secretary for United Food Operation, presented a check for $1,250 to the group at the 2013 campaign organization meeting on Nov. 29, 2012. Employees at the Dupont plant have been long-term supporters of the UFO effort. 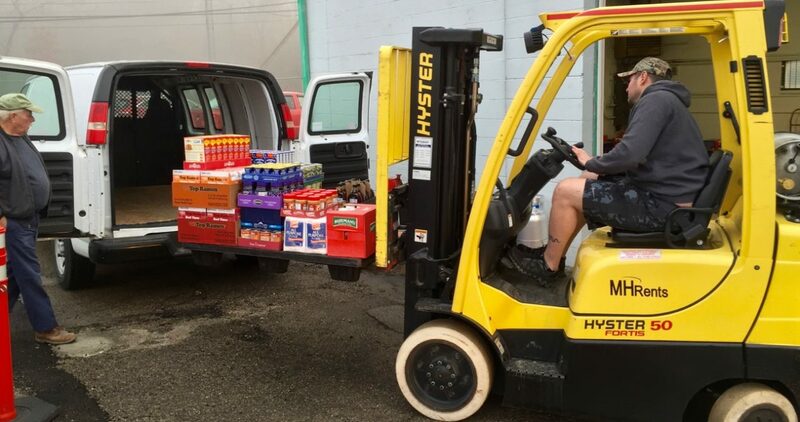 Dow’s Institute facility will supply the truck and driver needed to pick up bulk pallets of food and deliver them to the distribution center each Thursday. This will be done weekly for the duration of the 2013 food distribution program. The bulk pallets are broken down on Fridays by UFO volunteers and reorganized into pallets for each of the 13 participating food pantries. The pantries then pick up the food on Saturday mornings. UFO Chair Elaine Harris said the organization couldn’t be nearly as effective without the continuing support of workers and management at local facilities like Dupont and Dow. “We thank them for all they do,” she said. West Virginia charity groups are reporting an increase in the number of people seeking assistance. In the first nine months of this year there was a 6 percent increase in the number of West Virginians who called th statewide 211 hot line. Local news sources report that the callers are seeking help with food, shelter and utilities. The hot line fields 1,500 to 2,000 calls a month. If the upward trend continues, about 11,000 more people will have sought help with basic needs in 2011 than 2010. The United Way of Central West Virginia reports that it has undergone a 146 percent increase in the number of calls it has received in the first nine months of the year. More people are expected to seek help from our food pantries this winter. United Food Operation is preparing for its 30th annual winter food distribution program, which will run from January 13 to March 31, 2012. During this 10-week period United Food Operation will make weekly food distributions to 13 area food pantries in support of their missions to assist needy local families and individuals. The pantries are located across Kanawha and Putnam counties of West Virginia. Support for United Food Operation comes primarily from voluntary contributions by employees at Charleston, WV-area plants, public utilities, and government facilities. It was originally organized by and continues to receive strong support from local union members in the region. The group’s board of trustees met with representatives of the participating food pantries on November 17. They announced that the warehouse distribution center would again be supplied free of charge by Bayer Crop Science at the Institute Industrial Park in Institute, WV. Distribution will take place each Saturday morning during the program period.